Comfy Capitola Village Condo. Walk to All the Fun!! 2 rsv'd parking spaces! Condo, 2 Bedrooms + sofa bed(s), 1.5+ Baths, sleeps 5-7. 2 rsv'd parking spots! Beautiful well appointed Condo with great Village view from balcony/patio. 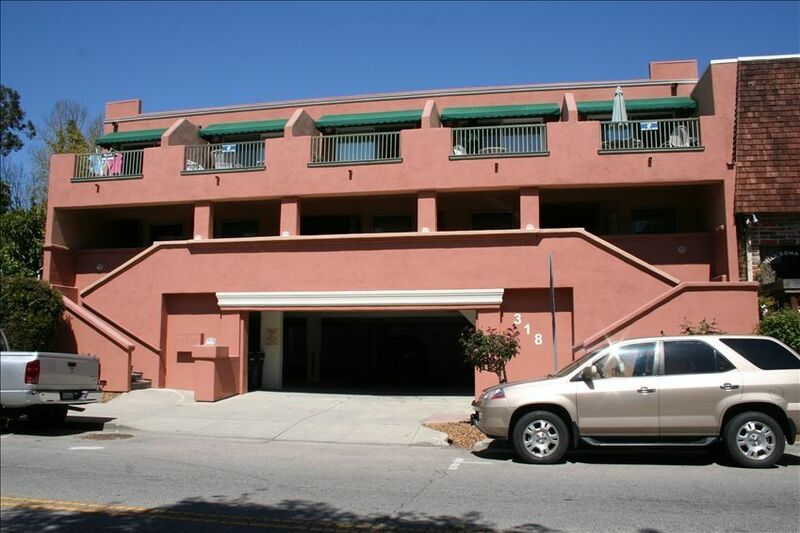 It is located two blocks from the Beach in the Village near all the Capitola Village amenities. Shadowbrook Restaurant on the river, Margaritaville, Zelda's, Wine Tasting and interesting Boutique shops. Reserved covered parking for two cars! We have owned this property for many years and have many repeat visitors! Come relax and get away from the hustle and bustle. Parking for 2 cars onsite. This is our family vacation home, we keep it in great shape. New stove, fridge, washer/dryer, microwave. New beds and bedding. Reserved parking for 2 cars. Central Capitola Village location. Fully equipped with cable tv, internet, linens......and views of Village from roomy balcony/patio. There is a full jack and jill type bathroom between the two bedrooms. Accessed from master bedroom, as well as hallway in order to serve second bedroom. Master bedroom also has a private sitting/make-up area with sink. Upstairs living area has a half bath. Slight View from front Balcony. Parking Garage with Reserved Spaces for 2 Cars. Regular towels provided but not beach towels. Small Rear Balcony and Front Balcony Overlooking Village/Slight Water View. Can be rented at the nearby Capitola Wharf. Paddleboards, surfboards, wetsuits, etc can be rented nearby at the Capitola beach or nearby surf shops. Golf is nearby at Aptos/Seascape Golf course. A Three Minute Walk to the Beach. Excellent Location in the Village. View of the Village from Balcony, Slight View of Ocean from Balcony. Bathrooms Have Been Updated with Granite Counters, Mini Market a Short Walk for Any Last Minute Items, 41st Avenue Mall and O'Neil's Surf Shop a Short 5 Minute Drive. We loved our stay and looking forward to next time! Great location, roomy, and very accommodating. This was a wonderful place to stay! It was steps from the beach, shops and good eats!! The condo was perfect size and had all the comforts of home! Great location and nice space! This property had everything we needed for a comfortable stay. The kitchen was well stocked with dishes, appliances, utensils; and it was a nice bonus to have a washer and dryer. Location was great- outskirts of the village, so it was quiet, but we were only a block off of the main street. Can't wait to come back! Always a pleasure to stay in Dan’s condo! This VRBO is extremely clean and comfy! It was steps to great restaurants and to the beach in a beautiful little community. And it had a short drive and easy access to Highway 1. Thank you! We highly recommend! We had a wonderful time in Capitola! My grandkids and I had a wonderful time in Capitola. Our comfy Capitola Village Condo had everything we needed and the location was the best in town. The condo is central to the village and we walked around town to dinner, breakfast, ice cream, the beach, the store, shopping, and enjoyed a concert on the beach on Wednesday night. The kids enjoyed the Boardwalk which was just a 15 minute drive from our condo...we'll be back for sure! Park your car in our two reserved parking spaces and walk 3 minutes to beach for relaxing, surfing, boogie boarding and great people watching. Wonderful views from walking or cycling up and down Coast from here. Walk to Zelda's, Margaritaville, Mr. Toots Coffee, Pizza My Heart, and the famous Gails Bakery! Rates and terms are subject to change until booking is confirmed. CANCELLATION POLICY: No refund if cancelled within 30 days, unless we re-rent for the same dates to someone else, then full refund.